Announcement Shipping cost now included in the item price for most countries. Handmade and hand knotted malas, mindfully made with care. Go to www.sphalie.com/faq.html to learn more about me and my malas. Shipping cost now included in the item price for most countries. I've ordered to malas from this shop both beautiful and well-made. Thank you for that Awesome Mala. All requests and orders will process when I get back. Treating myself with some of my favorite stuff for one complete week. There is NO internet access where I'm going. Je serai au salon Etsy Fait au Québec Trois-Rivières cette fin de semaine (24 et 25 septembre 2016) Venez m'y rencontrer. J'aurai plus de 100 malas différents. Prix réduits sur place. J'ai hâte de vous rencontrer. My malas displayed at a craft market. This was at the Etsy Fabriqué au Québec Trois-Rivières event in september 2016. It is a pleasure to meet new people, talking about the stones, the malas, and spreading the word on how to use them. The decision that changed my life! Caught in a professional lifestyle that was killing me, I gradually started making malas for friends of mine (as a steam releasing hobby). At that time, I was working full time, had 2 little toddlers in daycare, a house to care for, and a husband that traveled half of the time... I was really overwhelmed by all the daily ' to do ' lists. A blessing came my way when the daycare closed suddenly. That was the trigger I needed to stop my day job, stay at home with the kids and transform my mala making hobby into a not-so-full-time job. 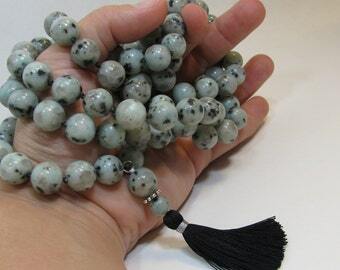 I provided malas for a master I know, and soon after, I opened my Etsy shop. Now the kids have grown up and are both in elementary school. This gives me plenty of time for making malas. Now operating full time, my mission is to provide gemstone malas made to last. 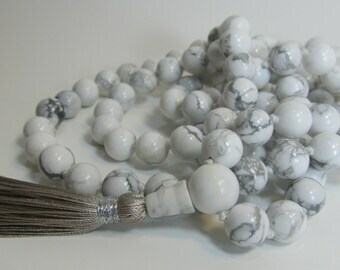 I was really annoyed by mala breaking... over the years, with experience, I've chosen the best supplies and developed techniques allowing the mala to last for years. I can now craft gemstone malas with bigger beads, confident enough in my work to warranty knotted malas one year against breakage! 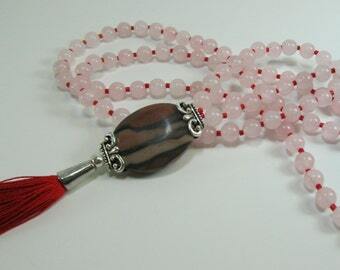 Alltime craftwoman + Meaning of life seeker + Meditation adept +Rocks and gems passionnate = Sphalie: Mala maker! Here's the legal bla bla I copied from a template and seemed to make sense to me. As a Canadian seller, I store your information in Canada. I may also store and process your information through third-party hosting services in the US and other jurisdictions. As a result, I may transfer your personal information to a jurisdiction with different data protection and government surveillance laws than your jurisdiction. If I am deemed to transfer information about you outside of the EU, I rely on Privacy Shield as the legal basis for the transfer, as Google Cloud is Privacy Shield certified. You can object to (i) my processing of some of your information based on my legitimate interests and (ii) I do not send marketing mail or email and do not intend in doing so with your information. In such cases, I will delete your personal information unless I have compelling and legitimate grounds to continue using that information or if it is needed for legal reasons. See the FAQ section at www.sphalie.com. Any item that is different from the photo (including changing tassel color) is considered a custom request. If your request requires me to buy supplies, a non-refundable deposit is required prior to the supplies purchase. This deposit is non-refundable. Cancellation will not be accepted after the supplies were bought. See the FAQ section at www.sphalie.com. 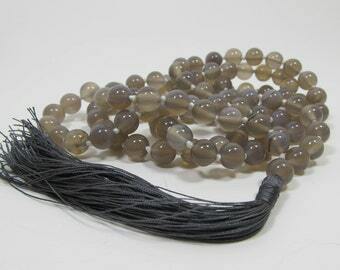 You will find a chart with overall length as well as photos showing lengths of different malas. Most products have 5 photos available. 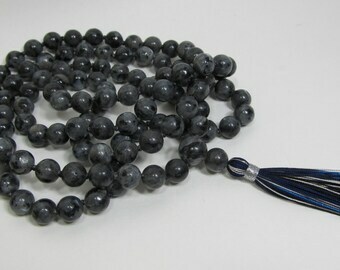 You will often see my fingers holding a bead of the mala so you can gauge the size of the beads accordingly. A chart is also available for tassel colors. See the FAQ section at www.sphalie.com for complete care information. Overexposure to sun, chemicals, soap and sweat may alter the appearance and resistance of your mala and void the warranty. SAFETY : RISKS OF STRANGULATION. DO NOT WEAR YOUR MALA WHILE YOU ARE AROUND MECHANICAL MOVING PARTS. DO NOT WEAR YOUR MALA WHILE SLEEPING. Request before ordering. Additional shipping and handling cost may apply. Wholesale policies will be send upon request.